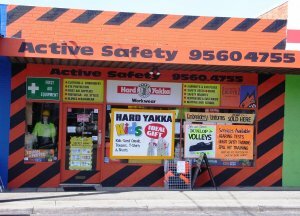 Active Safety Supplies has been in existence since 1984 and moved to its current location in Notting Hill in 1997. Owner Ted Boltong has been in safety for over 30 years and has a lot of experience in the safety industry. Ted is well known in the golfing and turf grass industry and is the winner of the VGCSA Trade Award 2009. We promise to provide quality product at a fair price while striving to offer service unequalled by our competitors. We do this with a friendly and informative manner at all times showing a professional empathy to every customer. At no time is any enquiry too difficult and every effort will be made to deliver a satisfying buying experience.